Come vacation at The Madrones and create new holiday traditions just a sleigh ride away. A short drive to Mendocino, Fort Bragg, or Ukiah, you can experience the fun and lighthearted pleasure of the Holidays. The Festival of Lights located at The Botanical Gardens in Mendocino has been a local favorite for eight years; Friday, Saturday, and Sunday Nov. 24th- Dec 17th. Adults are just $10 and children under 16 are free. Enjoy live music, wine, coffee, hot chocolate and so much more. Visit their website www.gardenbythesea.com for ticket sales and more information. 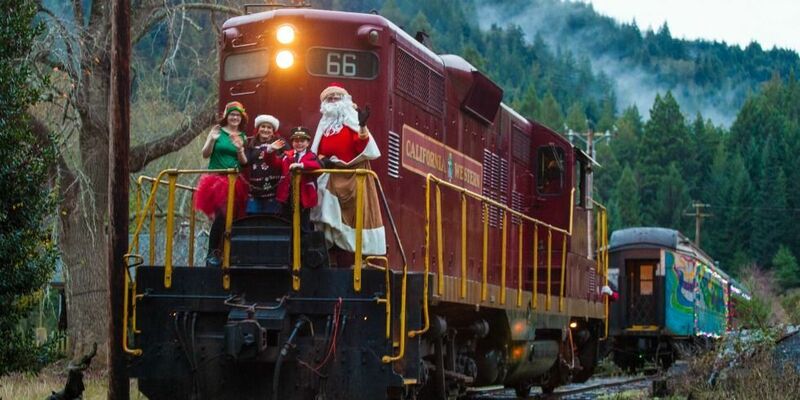 Magical Christmas Skunk Train from Fort Bragg, tickets include a 60 minute train ride through a storybook wonderland, cookies, hot chocolate in a souvenir mug, and a personal visit with Santa Claus himself. Visit www.skunktrain.com for scheduling and ticket sales. Buying tickets in advance is recommended. We look forward to having you as our guests this December! It is an absolute honor to be a recommended Inn in Andrew Harper's May hideaway report. After an anonymous visit this year we are now included with a handful of other properties in his prestigious directory of luxury travel destinations. Thank you Mr. Harper! We are thrilled to be on of your recommendations properties. The first bloom is here and our gardens never looked happier! We are looking forward to the weeks ahead as the show begins. The grounds are full of buds and we want you to experience the glorious display of our first bloom in Spring! Prior to searching the dates, select " Special Rates" type in promotional code MAYBLOOM. We would love to share this special season with you! The new Homestead accommodations at The Brambles are almost complete! The Brambles site in Anderson Valley was originally owned by the Marsh family and was used as a spiritual camp retreat. Come stay with us this Summer and be the first to experience our new lodging and cabins at this stunning redwood grove! Shipments are arriving and we are researching and inventorying the antiques and oddoties for our curiosity shop here at The Madrones. Looking at opening date of early Summer. We will be bringing back our curiosity shop in the spring of 2017 with a focus on one of a kind and vintage items. Below is a photo of the original store. We would like welcome Smith Story Wine Cellars as part of the vintner collective on the property. They will opening in February and located off the courtyard across from Stone & Embers. Drew Wines has moved into a new space on the property and we are working on a spa space for guests and visitors! One of our favorite day trips for our guests staying at the Inn at The Madrones. Montgomery Woods has some of the tallest trees in the world. Just on hour drive away from Anderson Valley, you can expect a peaceful, even magical walk in the redwoods. So beautiful and unknown to most travelers. There will be wine and chowder tasting, whale watching walks, sea cave kayak tours, craft fair, beer tasting, art exhibits and plenty more visit www.mendowhale.com for more details and to purchases tickets. We tell our guests what makes our Inn's location at The Madrones in Philo so unique is that you can stay in the vineyard in Anderson Valley, walk amongst our ancient towering redwoods, then take a short 30 minute drive to Mendocino to see one of the most stunning coastlines in the West! We a so excited to welcome back Big Sky Yoga Retreats for their annual retreat with Balo Vineyards! They will be calling The Madrones their home base for this gorgeous fall weekend here in the valley. Peonies!! The blooms are just starting to put on a show in the gardens. Check out the latest feature by travel trends expert Kim Westerman. See why Anderson Valley is the go to place.... and Philo in particular is where it is all happening! Our program is set for the 4th annual Cinema in the Vineyards on Memorial Day Weekend! This year is going to be amazing... Leslie Sbrocco is going to join us again as the presenter and we have quite the line up of films, wine maker dinners as well as the Farm to Table Fair here at The Madrones! Check out the details and mark your calendars. The wild trilliums are in bloom! Pruning officially started today at dawn -- what a beautiful February day!! !